UNITE AGAINST Fascism (UAF) have warned that David Cameron's speech on immigration is a "dangerous encouragement" to racist and fascist parties. [What's the point being made here? That Any criticism of immigration is ‘racist’ and/or ‘fascist’? Any criticism of immigration will encourage racists and fascists? Even if what the critics of certain aspects of immigration or multiculturalism say is true, they still should not say it because if they do, it will encourage the racists and the fascists. i) You must ban all talk of immigration, multiculturalism, etc. (as above). ii) You must ban all ‘far-right’ parties, such as they claim the EDL, etc. to be. iii) You must use violence against what they call ‘racists’ and ‘fascists’. 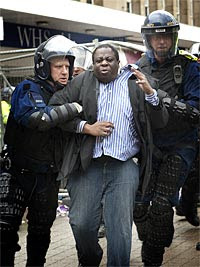 iv) The must protest against mainstream leaders and parties if they step out of line, as Cameron appears to have done. v) You must sack or intimidate ‘right-wing’ professors, lecturers, writers, journalists, etc. for saying the wrong things or for even doing politically unacceptable research (say, into genetics or what Trots call ‘biological reductionism’ or ‘social Darwinism’). In other words, you have to be far worse than the Stalinists/Nazis and the Stalinist/Nazi states in order to destroy or ‘smash’ (a favourite word of the SWP) racism and/or fascism (as they see it). Thus in order to defeat and smash fascism and racism, the UAF, and its mainstream helpers, must create and do things which are just as bad. There is one very good example of this which is very relevant to the EDL. UAF joint secretary Weyman Bennett, who accuses the prime minister of scapegoating immigrants for his government's cuts, said: "The effect of this rhetoric is more hatred, more hysteria and more strife and division in society. [‘Rhetoric’? Weyman Bennett has never said a single word, as a Trot leader of UAF/SWP, that is not both deeply rhetorical and fanatically ideological. I doubt that he can even order a coffee without bringing in some Trotskyist rhetoric into the request. 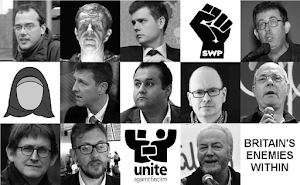 (That’s why every single SWP member and leader is a complete and utter bore. They are utterly humourless because they see hidden politics everywhere; and not just in Cameron’s speech. Then again, compared to Martin Smith, Weyman Bennett is a comic genius. Martin Smith, of the UAF, just really wants to kill a lot of people, be they ‘racists’, ‘fascists’, ‘neo-cons’, ‘Zionists’, ‘neo-liberals’, ‘far right’, ‘Tory toffs’, ‘Tory liberals’... every non-Trot basically, as well as some of them too (such as Chris Bambery). Bennett also mentions ‘hatred’, 'division’ and ‘strife’. But we all know, on the outside of the extreme left (as well as the extreme right), that this is precisely what Bennett does want (as well as need) - hatred, division and strife. Or, as he would put it, ‘mobilisation’, ‘demonstration’, ‘radicalisation’, ‘street protest’, ‘revolution’ etc. The worse it is, the better it is. The worse it is for everyone else, the better it is for the revolutionaries. No criticism of immigration or multiculturalism should ever be allowed. It simply doesn’t matter if what Cameron says is true (or just some of it). The point is that if Cameron, or anyone, speaks on the taboo subjects of immigration or multiculturalism, then they must be silenced. Now that is a terrible position to uphold and extremely dangerous. People can see through these lies and silences about immigration and multiculturalism. And rather than these lies and silences quietening the people down, they are making them angry. Very angry. And the more that Bennett, Cable and the others demand more lies or more silences from all public figures and politicians, the angrier the people will become.